These chairs are aptly called Ironica because of their spirited and ironic pairing of old and new. Our Ironica beechwood chairs, pictured here in a happy and cheerful yellow, arrive from TON CZ, a respected, European furniture maker. 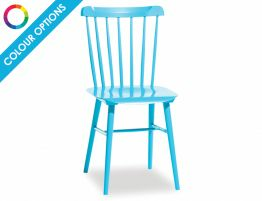 If you have had it with cheap, wobbly wooden chairs, you should consider our well-built dining chairs that you will enjoy for life. Our Ironica timber side chair is a clever mixing of antique, rustic and modern chair styles. Our wooden kitchen chairs recall the form of early American spindle back dining chairs or even popular mid century Modern Danish Spindle Chair styles. Yet our yellow Ironica chair has been modernized by the striking geometric forms employed. Our modern take on a classic country kitchen chairs offer the refined handcrafted look that makes them so unique. This dining chair’ starks geometry brings the design into the present day with the slender spindle back, angled legs and a gently sloped, saddle seat. You can go with a standard wood finish for a classic or rustic look or mix bold colours in this ever popular spindle back chair for fun twist on dining table seating. Likewise, our Ironica timber chair makes an appealing great desk chair or a comely vanity chair. 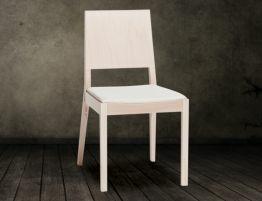 Our lightweight yet substantial wood dining chair is finished in yellow. Put these yellow wooden spindle chairs around your dining table, kitchen table or wherever you need a pop of colour, or affordable, attractive seating. We offer you a reinvented version of the classic American Windsor chair. 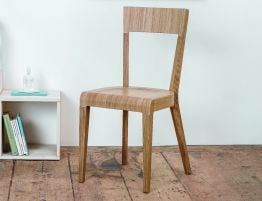 TON CZ took one part Americana and contributed one part bentwood furniture expertise to make this chair a bit modern, on trend and bold, bright addition to your kitchen or dining room. Turning the slender spindles carving the molded saddle seat and steam bending its gently curved back using techniques that have defined the fine wood furniture of TON CZ for decades. The seat of our Ironica wooden dining chair has been carved into a easy saddle shaped for comfort. 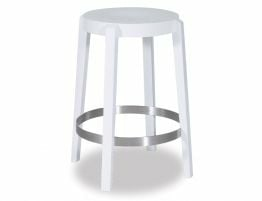 It is believed that the classic form of the original Windsor chairs came into being when wheel makers began making spindles for chairs very much the way they made wheel spokes. It is highly likely that the design was part of the development of Welsh and Irish stick back chairs but the look of this early chair has had many transformations over time.